SpeechOne comes with a studio-quality microphone and a built-in triple layer noise reduction filter for clearest audio recordings. With the professional microphone designed specifically for dictation and speech recognition you can record even in noisy environments, such as busy offices, and achieve extremely accurate speech recognition results and transcriptions. Uncompressed wireless recording enables free movement and pacing whilst working. You can easily move up to 5 meters (16 feet) away from your workstation and your recordings are safely transmitted to your computer in highest quality, without any interruptions. The cutting edge technology ensures every word is captured from the moment you press record. A voice prompt notifies the author when moving out of the wireless range. The SpeechOne is padded with three easily exchangeable cushions for ultimate wearing comfort and maximum hygiene. If you share a device with other authors, you can each have your own personal cushions. The microphone boom and remote control are made of antimicrobial synthetics that work against a wide range of different microorganisms such as bacteria, viruses, fungi or algae. This is especially useful in settings, such as hospitals for example. Benefit from the durable battery which lasts the entire work day. You can enjoy up to 12 hours of non-stop recording. The device can also always be used with a USB cable, just in case you forget to charge. The modern ergonomic design ensures comfortable working, even after many hours of use. The 360 degree rotating boom arm ensures that you can wear the microphone on the left or right ear and the microphone’s position is always optimal. A neckband can also be attached, if you prefer to keep the top of your head free. The included headband attachment can also be worn to reduce pressure and free the temple area and create more space between the head and the device, minimizing sweat and maximizing comfort. The stable and innovative docking station provides wireless charging and easy pairing between your device and the docking station. The magnetic mechanism makes docking the device incredibly easy. Simply snap-on the headset for a hassle-free and reliable charge. 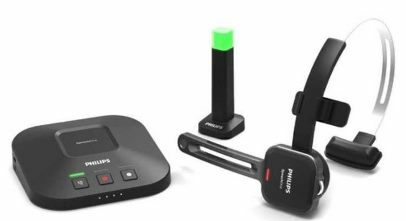 The AirBridge Wireless Adapter (available as an accessory) is a mobile lightweight alternative to the docking station to connect the headset to a computer. SpeechOne supports Skype calls so you can comfortably communicate in crystal clear audio quality without any additional installations or settings adjustments. You can accept or reject incoming calls directly on the headset or on the docking station and adjust the volume using the scroll wheel on the headset. Reclaim control over your availability by clearly signifying to colleagues whether you are "available” or "busy”. Thanks to its flexible, rotating magnetic mounting system, you can easily attach it on different surfaces. The light automatically turns red when you are using the headset to record or in a call. You can always change your status using the button on the docking station.